Help make life better for kids with cancer! Thank you for your interest in volunteering at the 12th Annual ASK 5K & Fun Walk! We can't put on this ASK family favorite event wihout you! As a token of our appreciation, volunteers will receive an event t-shirt and ticket to the Flying Squirrels game on Sunday, May 7th, at 12:05pm for ASK Day at The Diadmond. Here are the volunteer positions we need your help in filling. We ask that you select up to 3 shifts you're available to fill. We will make every effort to honor your requests. 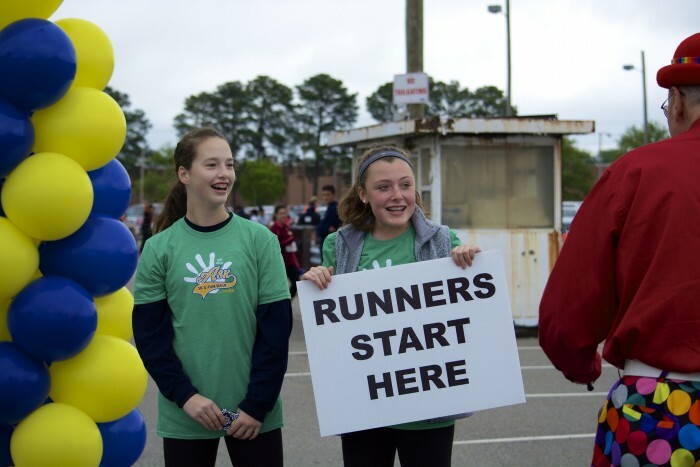 If you wish to sign-up as a group (5 or more volunteers), please email Britt Nelson, Race Director, at bnelson@askccf.org or call 804-658-5910. Time commitment on April 22: 7:00-10 a.m. Description: Set up course cones, signage, registration tables, festival area, etc. Deliver water station materials to designated areas. Description: Hand out t-shirts and goody bags to participants. Description: Will be stationed along the route and available to walkers/runners who need help. Cheer runners and walkers along as they pass. Also, help manage traffic, which is expected to be minimal at that early hour. Divide up after last walkers pass and walk the route in both directions to ensure trash is all collected. Meeting held at 9:15am to receive assigned place along the course and instructions in case there is an emergency along with emergency numbers. Description: Set up post-race snack/drink area. Hand out bottled water, bananas, and granola bars to runners and walkers. Close down and pack up area when finished. Description: Corral runners at start line at the beginning of the race. Guide runners toward finish line at the end of the race. Direct finishers up to concourse for post-race festival. Description: Help set up booths and game areas before the festival begins. During festival, make snow cones, run games, hand out prizes, and help at craft table. Help pack-up festival supplies and clean-up area. Description: Help take down signs, exhibits, and help make sure registration and booth areas are cleaned up.